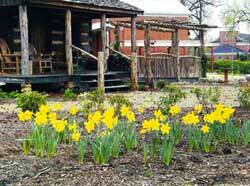 In April 2005, the Mauldin Garden Club was on the verge of blossoming. The initial idea budded during a beautification committee meeting in 2003, coming from former Councilwoman Judy McKinley. Later, the club started with 12 members who wasted no time getting their hands dirty, spending many hours laying sod, cleaning, and implementing their landscaping plan for the Mauldin Cultural Center (formerly Mauldin Elementary School). All the work was done by volunteers. The supplies not furnished by the City’s Public Works Department were purchased using garden club money raised from dues and fundraisers such as the annual Spring Fling. On December 1, 2006, South Carolina became the only state to have an Arbor Day in the last month of the calendar year. About 30 citizens met at the Log Cabin on the acreage of the Mauldin Cultural Center to plant trees in honor of the Armed Services. Celebrating Arbor Day is part of the recertification process for being a Tree City USA. The Mauldin Garden Club sold tickets in 2006 and 2007 for the BeachBall, an annual party whose profits help to change the lives of children through education and the arts. The profits from ticket sales went to beautify the Log Cabin with an heirloom vegetable garden, a Carolina fence garden, backyard habitat, butterfly garden, bluebird houses, and a birdhouse that is a miniature replica of the Log Cabin. Since 2005, the Mauldin Garden Club has hosted an annual Spring Fling which has become their largest fundraiser. The Spring Fling features a petting zoo, storytelling in the Log Cabin, vendors inside and outside of the Mauldin Cultural Center, plant sales, a silent auction, and a variety of homemade baked goods. The club has used money from the Spring Fling to landscape the Cultural Center, add a Serenity Garden, and provide free daffodil bulbs for public buildings, as well as benches and other hardscape items. On May 20, 2007, the Serenity Garden was opened on the east side of the Mauldin Cultural Center. Through the efforts of Mauldin Garden Club members, this barren tract of land was transformed into an enclosed courtyard with new sod, dogwoods, Japanese maples, decorative windows, a cedar arbor, a hanging swing and a tremendous lion head fountain. Plantings including rhododendrons, hydrangeas, autumn ferns, native azaleas, mountain laurel, and gardenias provide year-round color. In 2015 the Mauldin Garden Club announced the launch of its Distinguished Speaker Series. Our first speaker will be world-renowned National Geographic photographer, author and lecturer Sam Abell. Sam Abell’s work is complex, thoughtful, inspiring. He is considered one of the most articulate voices in media, with a knack for great story telling. Join us on Tuesday, February 9, 2016 at 7:00PM, at the Poinsett Club for this rare opportunity to meet and hear Sam Abell. Mr. Abell will be spotlighting photos from his spectacular, “Seeing Gardens” book. Drawing on 30 years’ experience as a National Geographic staff photographer, Mr. Abell brings to audiences his remarkable images and stories as a guest in some of the most select and compelling gardens in the world. Click here to purchase tickets and for more information on this and other Events. We are also proud to announce that after ten years, our annual Spring Fling has grown into the Spring In Bloom Festival & Bazaar which will be held on April 9, 2016. Make plans to join the many merchants, artisans, musicians and gardeners who will gather to celebrate the arrival of spring. Click here to find out more. Currently, the garden club has 22 men and women who meet the second Tuesday of each month, September through May, to learn more about gardening from local master gardeners, share gardening tips with each other, and plan more ways to bring the beauty of flora to the Mauldin community.